​Rainforest Listening encourages global communities to engage with one of the most critical environments on earth, the Amazon Rainforest. The installation features pristine sounds recorded in a diversity of ecosystems including lowland tropical rainforest with abundant wildlife. Listeners can hear the rich biodiversity of insects and birdlife and those who venture deeper into the sound maps can discover the endangered Amazon River dolphins or elusive howler monkeys hidden throughout urban environments. 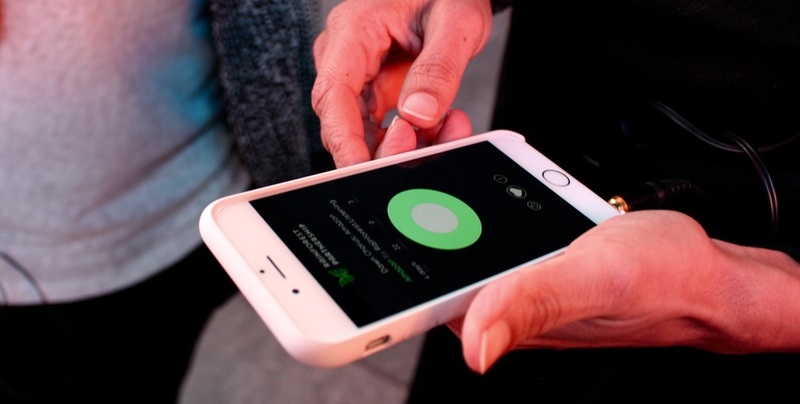 Rainforest Listening launched during Climate Week NYC 2015 in the centre of Times Square where the sounds of the rainforest grew in iconic locations such as Central Park and Dag Hammarskjold Plaza, the gateway to the United Nations. Hundreds of people experienced the installation during Climate Week and the work received critical acclaim from high profile New York arts and cultural organizations resulting in a permanent installation in New York City and a global touring exhibition in 2016. Rainforest Listening is now growing across the USA and launched in Europe in December 2015 as part of COP21 in Paris. Considered one of the most important events of this decade, the conference objective is to achieve a legally binding and universal agreement on climate, from all nations of the world. ​We live in a visually dominated society where we often neglect our auditory perception, yet it provides us with more information about our surrounding environment than any other sense. Listening and embodied engagement with sound has the ability to connect us to environments and inspire us to think in different ways. Listening to the rainforest connects us in an immediate and embodied way that is not possible with any other sensory experience. What if we could walk through iconic locations across the world and listen to the Amazon in real time? Would we think differently about rainforest conservation? Rainforest Listening explores the value of sound in contributing towards environmental awareness and engagement. As the recent documentary Racing Extinction highlights: if we can bring the sights and sounds of the natural world to humans who would otherwise never think about them, they might be motivated and inspired to alter their habits enough to take action and respond to the ramifications of climate change.​ Creativity combined with innovative technology has a clear opportunity to inspire environmental stewardship through empathy and community engagement. Many suggest it is the most valuable tool we have to elicit an emotional response and create culture change. Mobile technologies have completely transformed how we interact in physical and virtual worlds. While many suggest smart phones disconnect us from nature, they also have the potential to reconnect us to natural environments in innovative ways. As the next billion people come online through accessible mobile devices in the next five years, there are clear opportunities to harness the power of virtual technologies for community empowerment at local and global levels in response to the ramifications of climate change. Rainforest Listening explores the sonic potential of mobile technologies and engages our auditory perception to inspire climate action. If a picture is worth 1000 words, then we believe a sound is worth 1000 pictures. Rainforest Listening is produced by Rainforest Partnership, an international NGO founded with a mission to protect tropical rainforests by partnering with people at global and local levels to create lasting solutions to deforestation. This unique artistic partnership is designed to use art as a catalyst for global engagement and awareness. Listen to Niyanta Spelman, Executive Director of Rainforest Partnership speak about the launch of Rainforest Listening in New York with the UN Foundation in Austin, Texas during SXSW Eco 2015.